Updates from Asymptote’s international team: new publications, plays, and exhibitions for the curious reader! Past contributor Aya Ogawa is proud to see her play Ludic Proxy near its world premiere at New York’s The Play Company. Each act of this multi-media play centers around a distinct story: Act 1, in the past, takes place in Chernobyl; Act 2, in the present, is about Fukushima; and Act 3 takes viewers to the future. The play explores our relationship to technology and is a “beautiful, haunting and magical piece that pulls you into uncharted territory where memory, fantasy and virtual reality swirl together.” First previews begin April 1, and the not-to-be-missed play runs until May 2 at WalkerSpace in TriBeCa, 46 Walker St, NYC. “The surreal atmosphere of Self-Portrait in Green began to create disturbances in my own reality,” writes assistant editor Erin Gilbert in her review of Marie NDiaye’s obsessive memoir, now up on Brevity. She also has a poem in Issue 13 of Structo. 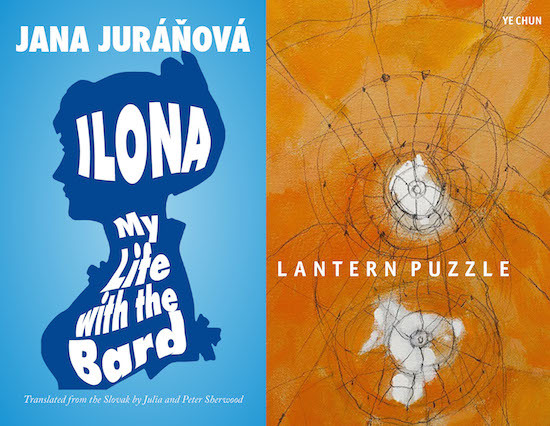 Editor-at-large for Slovakia Julia Sherwood saw her and Peter Sherwood’s translation of Ilona: My Life with the Bard published by Calypso Editions. The duo deliver a “superb translation [that] renders faithfully the sense of a woman’s world around the nostalgic period of the fin de siècle,” according to Martin Votruba of the University of Pittsburgh—just one bit of the extensive praise that Jana Juráňová’s novel-in-English-translation has received. Editor-at-large for Denmark Katrine Øgaard Jensen gave a talk on contemporary Nordic literature in Washington, D.C., on March 12, along with the authors Lars Ramslie and Christian Jungersen. The event was called “Out of Denmark and Norway” and was a collaboration between The Writer’s Center and the Danish and Norwegian embassies. Editor-at-large for Bosnia and Herzegovina Mirza Puric was involved as a translator in the International Writing Program’s collected work Narrative Witness: A Caracas-Sarajevo Collaboration. The project involved 22 writers and photographers in Caracas, Venezuela, and Sarajevo, Bosnia and Herzegovina, coming together in an online exchange to create fiction, nonfiction, and photography. Simon Morley, past visual editor and contributor, has a solo exhibition at Gallery Baton, Seoul, on view until April 11 for Asymptote‘s South Korean (or traveling!) readers. The exhibition “presents a group of new paintings that bring cinema and literature into contact upon the monochrome surface of painting.” Inspired by Robert Aldrich’s 1955 film noir Kiss Me Deadly from which the exhibition takes its title, Morley’s work features undifferentiated fields of color, with words and images gradually emerging. Past contributor Ye Chun’s book of poetry Lantern Puzzle has just come out from Tupelo Press. D.A. Powell characterizes her work as “remarkably gorgeous, courageous, astute, and inspiring […] solidly anchored in both the world and the imagination—in fact, they use one in order to make the other possible.” Chun will be doing a book signing at AWP from 2:00–2:30pm at the Tupelo Press booth—stop by with your copy and say hi!